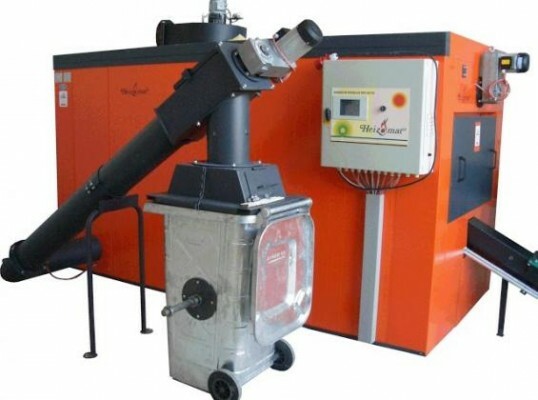 With automated fuel supply to the boiler from the bunker, automated de-ashing, ignition and self-monitoring this boiler involves near zero maintenance and provides as reliable and simple to use heating as any oil, gas or propane system. Plug and Play Containerized Option. 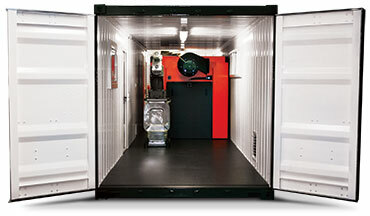 Pre-installed into a 10, 20 or 40 foot container with plumbing and electrical work complete. This solution includes the bunker, chimney and a side door for loading. Simply drop onto your site and connect in to your electrical and underground water pipes. 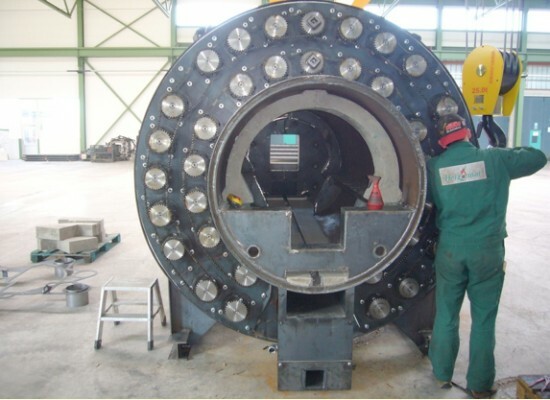 German engineered by highly trained blacksmiths, engineers and technicians in a family-owned innovation and manufacturing facility this boiler is built to last using solid core augers, continuous seam welds and high grade boiler steel. 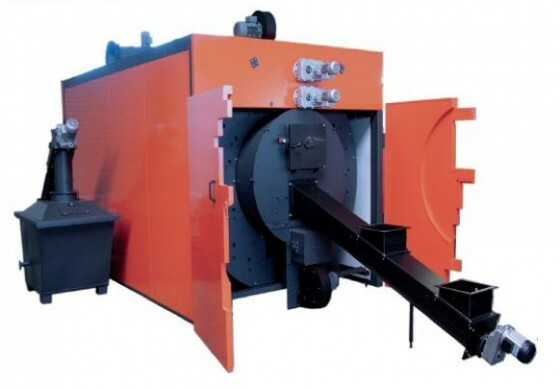 HSK-RA 15-198kw This series comes at a lower cost and provides a compact solution to heating with biomass. 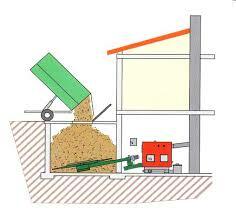 Besides woodchips, it can also burn wood pellets, saw dust and shavings. RHK-AK 30-990kw + These boilers are regarded as the most solid and omnivorous boilers on the market. 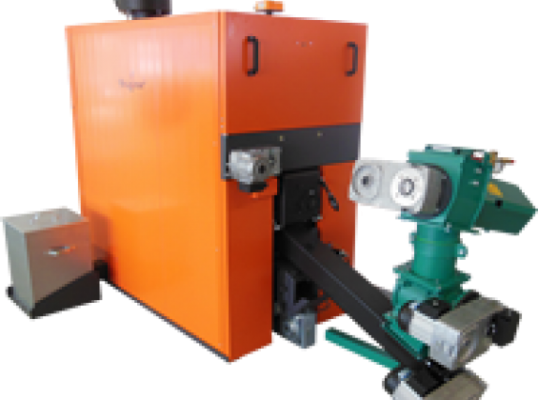 The robust de-ashing system can deal with the most problematic biomass fuels including low-grade chip with high bark content or foreign materials (such as nails) from construction offcuts. 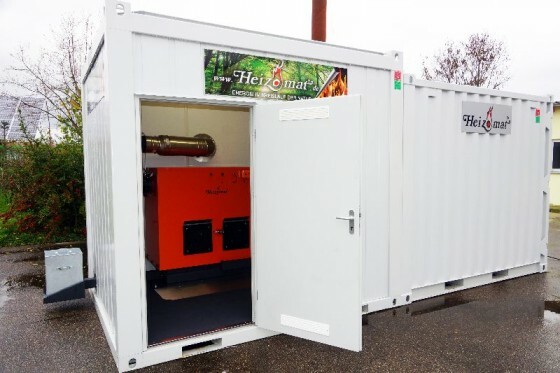 Fully equipped containerized solutions are available and come with built in bunker, boiler room, plumbing, electrical and chimney. A true Plug & Play option. Custom configurations can also be created to fit into your new or existing building and bunker. Our engineers will help you to design a solution that fits your unique opportunities. 1. 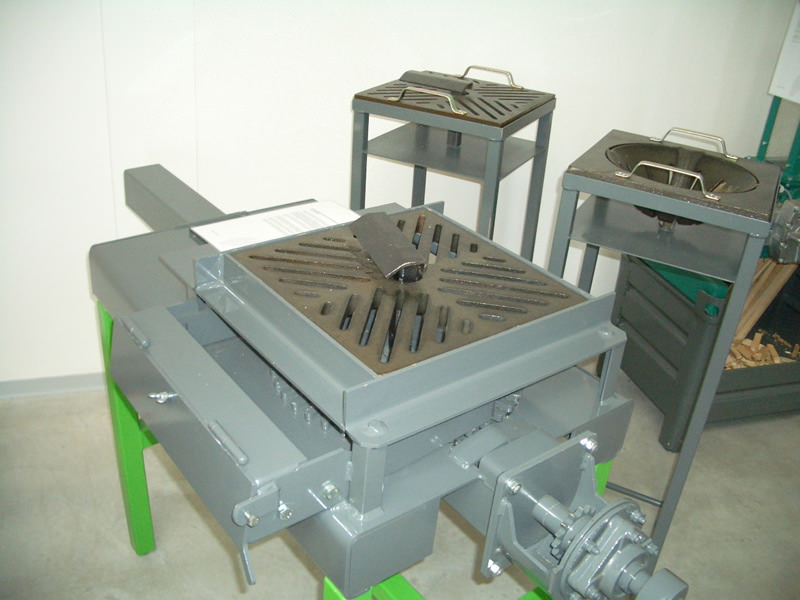 Chain linked parallel extraction arms draw your fuel into the feed augers from the furthest corners of your bunker and are available in diameters up to 7m. 2. Open and closed solid core feed augers with loosening geometry provide trouble-fee fuel transport and apply up to 3,700 lb·ft of torque to crush and move larger chunks and branches up to a couple of inches in diameter. 3. 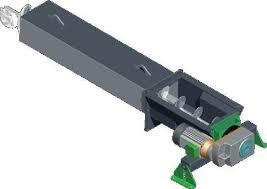 The milling cutter can reduce oversized fuel down to size enroute. 4. The rotary valve prevents back burn by completely isolating the boiler from the fuel store even during power outages and it’s auto-reversing ability prevents jams. Glow bar ignition: Electrical glow bar(s) are initially activated by a start button on the SIMATIC Control panel. Automated infeed, ignition of the fuel and building of the firebed follows. 1. 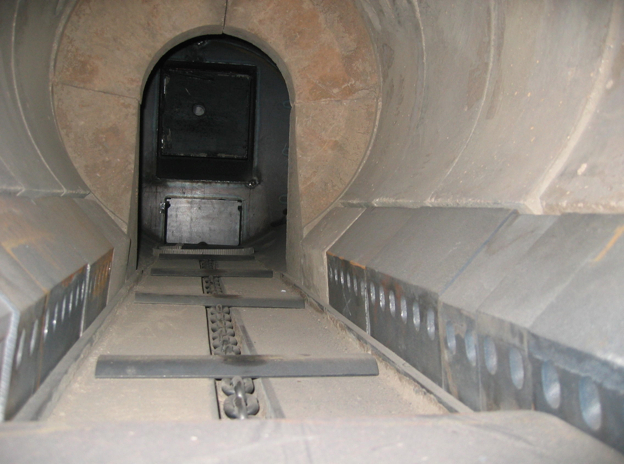 Drip-fed continuous burn maintains embers in the combustion chamber through the slow feeding of fuel and minimal ventilation. When heat is required the fuel feed and ventilation are automatically increased to meet the demand. 2. Glow bar ignition as needed. When heat requirements are low the boiler can be programmed to allow the fire to go out. Glow bar ignition is then reactivated by heat requirements or by timer, to restart the fire and heating process. The combustion chamber is constructed of refractory concrete with a full fireclay lining for optimal transfer of heat to the boiler water. 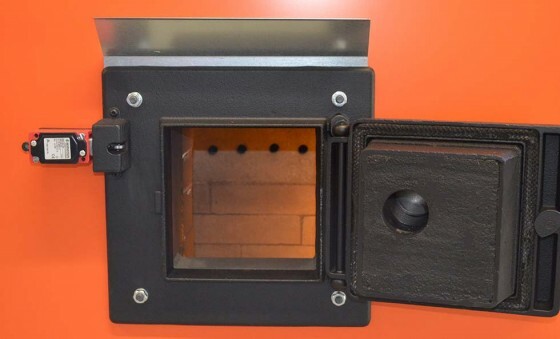 The counter rotational ventilation system ensures the cleanest burn by adding primary air directly to the fire bed and secondary air through the sides of the chamber, which significantly increases the heat yield. Intelligent controls ensure highly efficient combustion at both partial and full peak load by controlling the fuel feed based on the return water temperature, and the flue gas temperature and oxygen content. Continuous heat exchanger cleaning maintains the high efficiency of the boiler over time and is achieved through multiple de-ashing augers mounted in the heat exchanger tubes that rotate to collect soot/tar from the hot gases and feed them into the ash cleaning system. 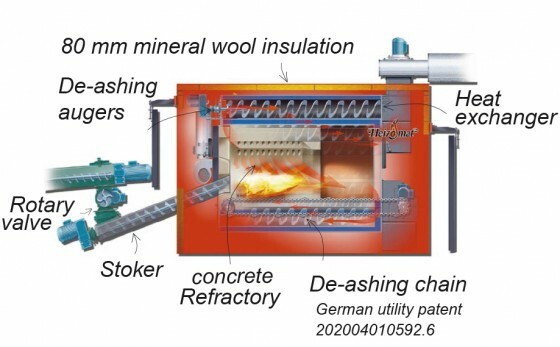 Automated ash removal in the firebox is achieved through a chain and flight system in the RHK series and a sweep arm and grate system in the HSK boilers. 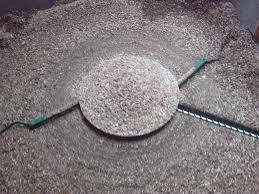 Both provide efficient ash removal into a galvanized ash bin outside the boiler for easy disposal. 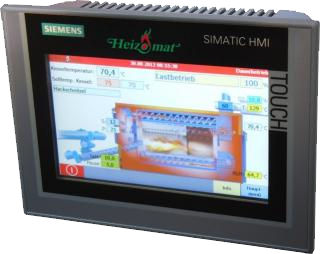 7″ Touch screen SIMATIC controls manage full automation of the system and are able to be linked to text alerts and remote monitoring to ensure confidence and peace of mind. 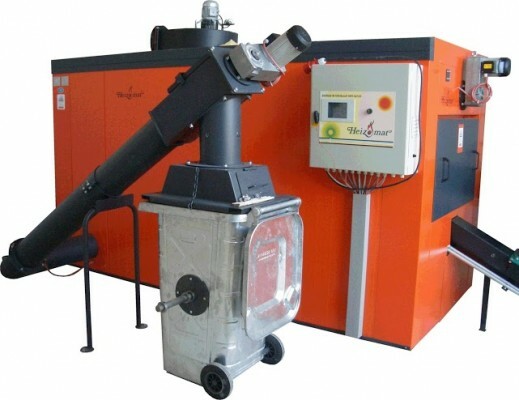 The boiler is constantly monitoring and controlling the amount of fuel, the temperature of the exhaust gases, the temperature of the return water and the heat demand to ensure that the boiler is always operating optimally. Two operating modes are available for when heat is not required – self-ignition or drip-fed continuous burn. 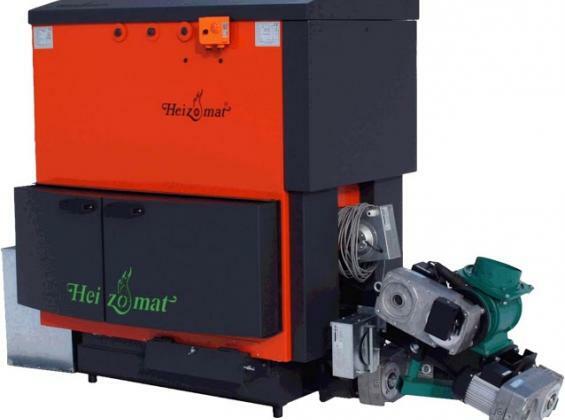 Built for automation and long life Heizomat boilers require very little maintenance. 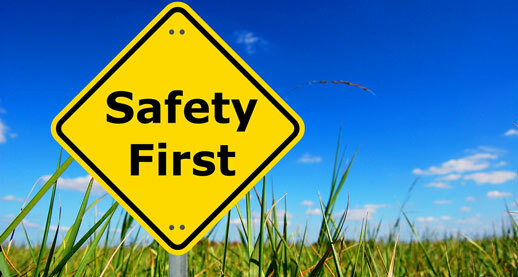 Automated text messaging is available to provide instant alerts should attention be required. 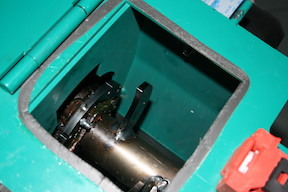 In addition to sealing moving parts from dirt and dust to prevent wear and tear, a lot of thought has been put into ensuring safe operation of the boiler, such as restricting access to moving parts with tamper-proof safety switches and the use of a mechanical rotary valve on the feed system that prevents the possibility of fire escaping back into the feed auger. Built to last by highly trained blacksmiths, engineers and technicians in Bavaria, Germany. No third party outsourcing is used as many competitors do. These boilers are manufactured from ST 37.2 strong boiler steel. Try comparing the weight of our boilers against our competitors! The very first boiler was installed over 30 years ago and is still going strong. Customers who visit Heizomat in Germany are easily convinced of the dedication to high quality and solid manufacture combined with smart design and high tech innovation. Local representation in North America ensures that you have someone to call with your questions and needs for support. At Heizomat GmbH and Heizomat Canada we aim to provide the highest quality support and advice from our highly experienced technical staff. Whether you want information on boiler service plans, technical advice and support or just simply want advice on the most appropriate biomass solution for your application, our trained support staff are here for you. Assembly service: Boiler assembly including wiring to the control panel must either be performed by or guided on site by a Heizomat trained technician. After assembly the system is pre-commissioned to test all motors and sensors are operating correctly and is then handed over to the plumbing and chimney installers to complete their works. Installer training and support : we have a demonstration site in Ontario from which we offer installer training and carry out various informative events. Technical support helpline for installers and end users. Emergency support helpline for end users. Warranty: We provide full support for manufacturer’s warranty which is up to 5 years depending on parts. Spare parts: We stock most parts at our location in Ontario for quick supply as needed.